Like virtually all travelers to Myanmar, I devoted part of my trip to Bagan, Myanmar’s ancient capital. With more than two thousand temples and monasteries scattered across the countryside, Bagan is one of the country’s most visited destinations and certainly one of its most photographed. Panorama from 3 horizontal shots, focal length 48 mm, aperture f/11, shutter speed 1/10, ISO 64, tripod. 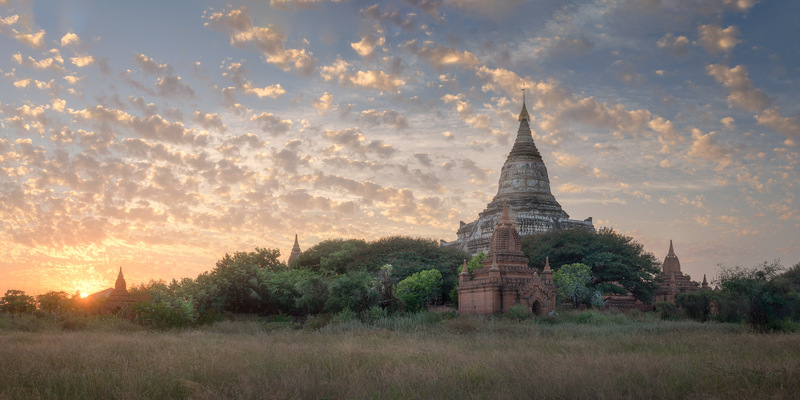 One would have to stay in Bagan for weeks or months to even begin to see all of the temples. My time was limited, so I rented an eBike at my hotel and planned to cover as much of the archaeological area — a twenty-six square mile space — as possible, stopping at all of the temples that caught my eye. Bagan is justifiably popular among tourists. It’s a fanciful landscape of ancient spires and stupas nearly as far as one can see. Though in some respects it was nothing like the silent and still site of Inwa, I again experienced the sense of having stepped into a distant, inscrutable time. Like many places in Myanmar, Bagan has been struck by earthquakes numerous times over the years, most recently in 2016. The 2016 earthquake damaged hundreds of the city’s temples, many of which are now in various states of repair. Because of the damage to the temples, Bagan has prohibited visitors from climbing to the top, meaning that my photographs would have to be taken on the ground. Fortunately, the temples of Bagan are beautiful no matter your vantage point. I headed to Shwesandaw Pagoda, which occupies a prominent position in the center of town and is one of Myanmar’s most beloved pilgrimage sites. Shwesandaw means “golden holy hair,” a name given to the temple because it reportedly enshrines hair from the Buddha. The area is famous for its sunsets, a spectacular sight when the pastel light of a late afternoon falls on hundreds of delicate stupas. I lingered in Bagan until the sun began to move closer to the horizon and then I set about photographing the ancient spire of Shwesandaw. I found myself continually thinking of an old song, “Golden Hair,” by Syd Barrett, founder of Pink Floyd. It was an altogether pleasant way to end my day in Bagan. This entry was posted in City and tagged Bagan, Myanmar.